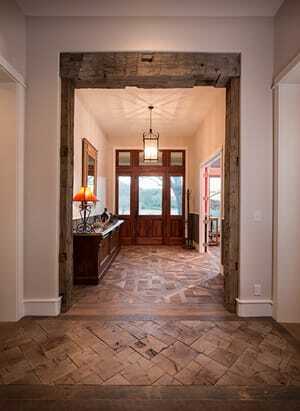 From the floors to the ceilings of this Hill Country home, wood is the natural theme. When they decided to build on their creek side property, the owners of this sprawling Texas ranch made low maintenance high priority. From the floors to the ceilings, every detail of the home was selected for its natural look and finished, or unfinished as the case may be, to weather and mellow over time. Even the flooring fits the no-maintenance prerequisite. And the laid-back, Hill Country vibe. For reasons aesthetic and sustainable, the owners settled on reclaimed flooring throughout the house. Which made Schenck & Company the ideal choice. “Rustic and reclaimed flooring is one of our specialties,” said Greg Schenck, company president. “It’s one of my personal passions.” It’s a passion that has paid off for Schenck as his company has twice won the Wood Flooring of the Year award from the National Wood Flooring Association, once in the Mixed Media category and once in Reclaimed. Yet Schenck & Company’s involvement in the home wasn’t limited to the floor. They also sourced and supervised installation of the wooden beams used inside the home as well as on its porches. They created the wooden door jam and header between the entry hall and the family room as well as two mantels and a kitchen lintel. Schenck even crafted a wooden sofa table for the family room, using left-over, weathered oak beams and a wrought iron base. Wherever possible, the owners chose to finish their home with materials native to the central Texas landscape. The home’s exterior features limestone. Inside, native varieties of wood include mesquite, oak and cypress, all of which grow abundantly in the area. 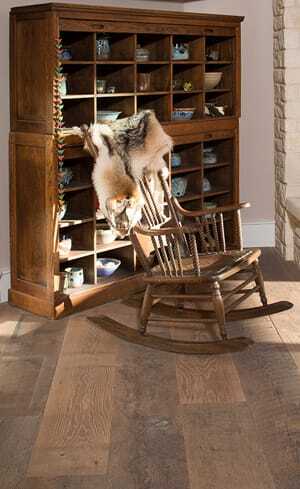 Flooring throughout the home is aged and weathered white oak, a hard wood that stands up to heavy traffic. All the floors are finished with European penetrating oil, a protection that is ideal for reclaimed flooring. The oil actually embeds into the pores of the wood so there’s no surface finish to maintain. Just sweep or vacuum and enjoy. For the entry, a Versailles pattern was selected, though the effect is more Texas chic than French chateau. The pattern was created in the Schenck & Company workroom in the Houston Heights, then installed on site and lightly smoothed. 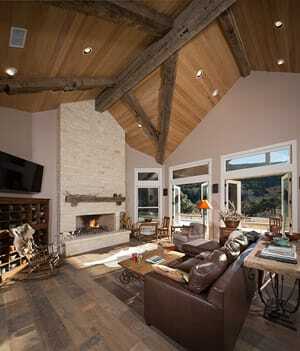 The family room also features weathered white oak flooring, cut into planks up to 12 inches wide. “The room is so voluminous, it called for particularly wide floorboards,” Schenck explains, “It’s all about proportion.” Planks in the bedrooms are more narrow, again, to suit the rooms’ dimensions. Upping the ante on creativity. Using specifications provided by the contractor, Schenck personally sourced the reclaimed beams from a mill in Idaho. “I choose beams that fit the specs, of course, but I also looked for hand-hewn wood, pieces with character,” he says. “I love the unfinished look, the character of wood in its natural state.” Like the floors, most of the beams are white oak but not all. “There’s a little bit of soft wood mixed in,” Schenck says. Like a lot of things in life, wood mellows with age. Left unfinished, the beams will soften and gray over time. And the floors will begin to tell a new story, of their second life in a well-loved home. The homeowners are good with that. They, too, are reclaiming nature, mellowing out on a beautiful ranch in the Texas Hill Country. What’s not to love?